RPSC PTI Grade II & Grade III Exam 2013 Result Declared- Download RPSC PTI Grade II & Grade III Exam 2013 Scorecard - Check RPSC PTI Grade II & Grade III Exam 2015 Marks Details - Download RPSC PTI Grade II & Grade III Exam 2015 Merit List - Download RPSC PTI Grade II & Grade III Exam 2015 Interview Schedule - rpsc.rajasthan.gov.in. Latest Updates/ Latest News - Download RPSC PTI Grade II & PTI Grade III Marks / Scorecard has released on 24th June 2015. 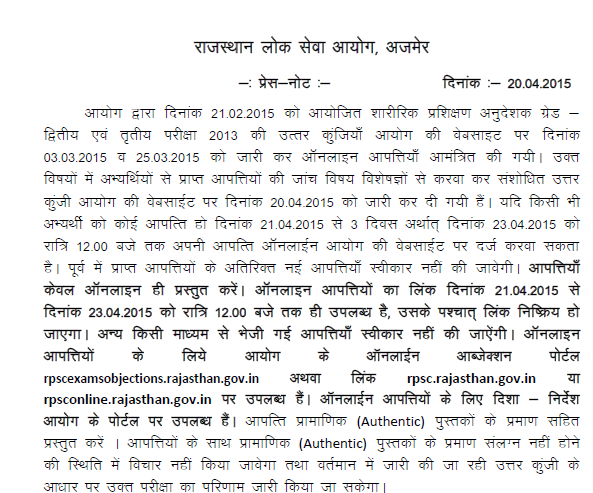 RPSC had declared PTI Grade II and Grade III Exam 2013 list of candidates on official website www.rpsc.rajasthan.gov.in. This list of candidates had released roll number wise of the candidates on 14th June 2015. This list of candidates to be checked for eligibility for RPSC PTI Grade II and Grade III Exam 2013. Those candidates who had applied and appeared in RPSC PTI Grade II and Grade III Exam 2013, they can check their result here. RPSC PTI Gr II/III Exam 2013 Result Direct link Download Preamble & Cut off List of Candidates PTI Grade II / Download Preamble & Cut off List of Candidates PTI Grade III. is going to announce result of this written examination which is expected to be released in end of April 2015 on the official website rpsc.rajasthan.gov.in. Earlier, RPSC had released notification 8/Exam/2013-14 against recruitment of 3899 vacant posts of Physical Training Instructor Grade II & Grade III on 18th September 2013. The last date for application was 20th October 2013. A huge number of candidates had applied for these posts in which a total of 14700 candidates (approximately) had appeared in this written examination and waiting for result. Those candidates who had appeared in this written examination and waiting for their result / scorecard/ marks details/ merit list; they can download their result from the direct link provided in the end of the posts. · Save and print the result Hard Copy for appearing in personal Interview. The written examination was conducted on 21st February 2015 by Pen Mode. An OMR Sheet was provided to darken circles by the blue/black ball point pen as answer for the question which was asked in the question paper. The written examination was consisted of two papers i.e. Paper I & Paper II. Both the paper were of Objective Type Questions based on multiple choice questions in which four options were provided as answer. Candidates were required to select one option as answer in written examination. In written examination, Paper I, questions were asked from various topics such as Cultural , Geographical, Historical, and General Knowledge of Rajasthan were of 80 Marks, Current Affairs of Rajasthan were of 20 Marks, General Knowledge of World and India were of 60 Marks, Educational Psychology were of 40 Marks. Total 100 numbers of questions were asked for a total of 200 Marks. The time duration for Paper I was 2 hours or 120 minutes. A total of 130 numbers of questions were asked for a total of 260 Marks. The time duration for Paper I was 2 hours and 30 minutes or 150 minutes. The 40% marks are required to qualify written examination.